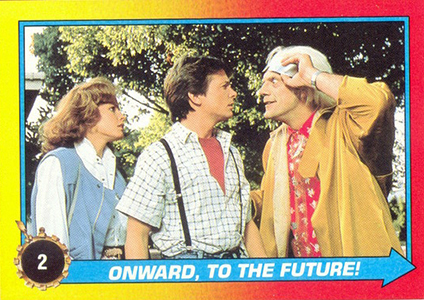 1989 Topps Back to the Future II is the only full set of mainstream trading cards dedicated to a film in the classic franchise. It fits with other Topps entertainment sets of the era, delivering a simple checklist of cards and stickers. As popular as Back to the Future has become, the set is still extremely affordable. The 1989 Topps Back to the Future II base set has 88 cards. They go through the film's story. Towards the end of the set, there is a subset that highlights the futuristic vehicles from the movie as well as a couple of cards with promotional shots. Card fronts do look a little dated. They feature a gradient border that goes from yellow to red. For baseball card collectors, it hints a little at what would become 1990 Topps Baseball. The majority of images come directly from the film. Captions are at the bottom of the card, inside a blue arrow that clashes with the rest of the design. Card backs are on the simple side. The film's logo takes up about half of the card leaving little room for much of a writeup. Large fonts and a headline guiding collectors where to look next further limits the amount of text. 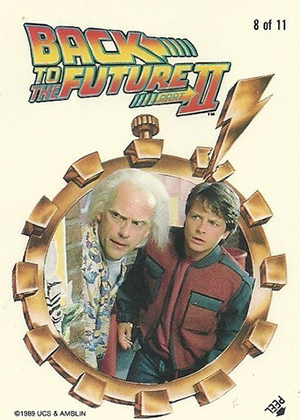 Every pack of 1989 Topps Back to the Future II trading cards also comes with a sticker. Most have an image of Marty or Doc inside the stopwatch used in the movie logo. The overall design for the 11 stickers is much more simple that a lot of other 1980s Topps sticker inserts. There are no thick borders. Instead the background is white. Also, stickers are not die-cut. The entire front has to be peeled. Sticker backs can be put together to form a puzzle. For many, it may be hard to believe that there is no full set for the original Back to the Future or even a modern trading card take that encompasses all the entire trilogy. This is as close as collectors will get. There are a few premiums and oddball cards for the first film, but not a full-blown set. The closest thing would be a sticker collection and album released by Panini for the international market. 1989 TOPPS BACK TO THE FUTURE II WAX PACK "4" PACKS! 2 Onward, to the Future! 3 The DeLorean Takes Off! 12 Check This Place Out! 36 I Want My F-TV! 40 A Peekaboo from Guess Who? 43 "What Could Be Wrong?" 47 The Whole Town Has Changed! 53 Biff Hits the Jackpot! 56 Not This Time, Tannen! 62 Another Way to Travel! 68 "Somethin' Weird's Going On...!" 70 When the Time Trippers Collide! 76 Trapped in the Past! Note: Stickers do not have captions. These are descriptions of the image on the sticker front.